EZ-NET from Falcon Technology is the perfect system for those on the move . Now you can achieve high speed broadband internet across UK and Europe for only £1500. The portable kit is designed specifically for motorhome, caravan and camping use. EZ-NET uses two-way satellite technology and communicates directly with the HYLAS-1 satellite so you get high speed broadband wherever your travels take you. Systems such as I-Boost and those from Zead are nothing more than WiFi and 3G signal boosters . 3G or even 2G signals are weak or non-existent on camp sites and rural areas (particularly in Western Europe). Even if the site does offer WiFi, it is often poorly distributed, expensive and just about (if at all) reaches your van. 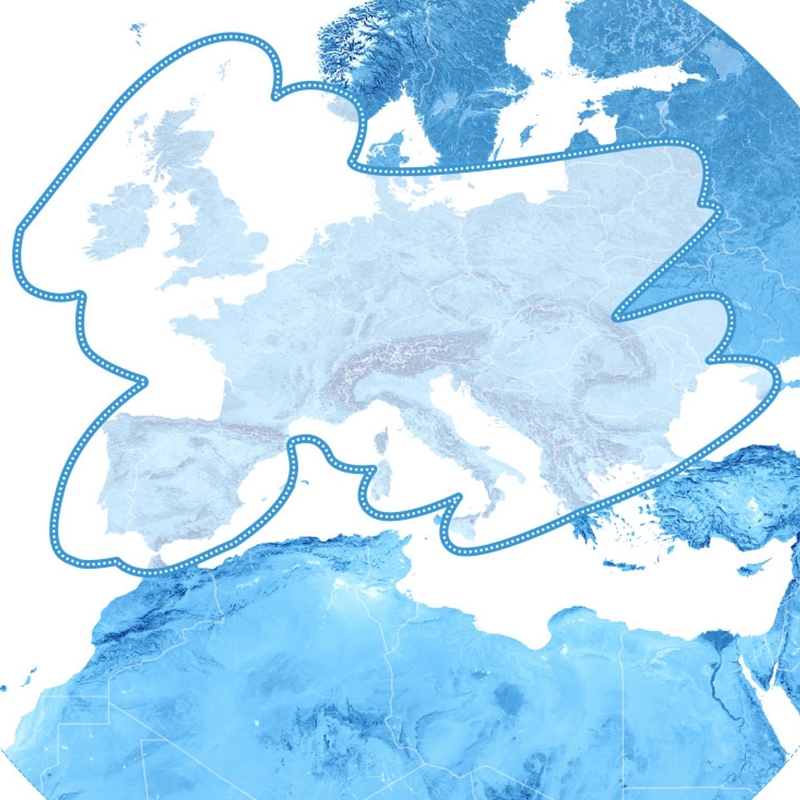 Of course the other advantage is that the system works across most of Europe – so you’ll be able to keep in touch without running up huge roaming bills – add a VoIP account such as Skype and keep in touch by phone too! EZ-NET creates its own high speed WiFi hotspot so you can enjoy fast internet connections wirelessly on your laptop, iPhone, iPad or other smartphones or tablets. The EZ-NET satellite internet system allows you to be online within minutes from unpacking your kit. 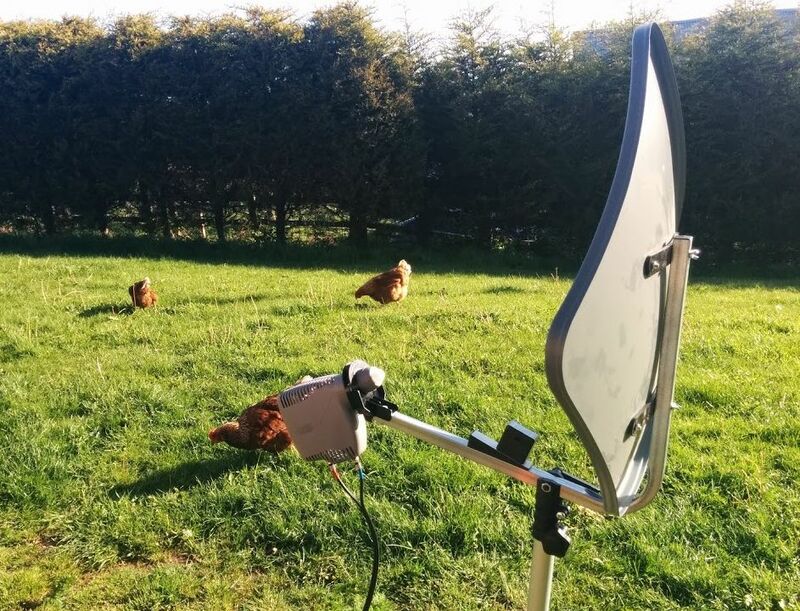 The EZ-NET system uses our patented satellite alignment & elevation device conveniently placed on the arm of the dish to set the required elevation. In addition the EZ-NET comes with unique Point & Play easy-installation technology, Point & Play provides correct satellite identification and facilitates pointing with an audio feedback. 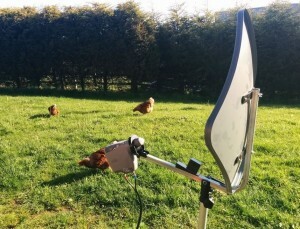 One of the main advantages EZ-NET offers is its size, weight and unique EZ-TILT dish mount and tripod solution. Up to now satellite internet has only been possible using very heavy hardware and large dish sizes, rendering the kit virtually impossible to tripod mount and tether down. EZ-NET complete system has a stow-away weight of under 10 kg. EZ-TILT places the dish perfectly balanced above the tripods “centre of gravity” (CoG) so elevation and rotation adjustments to the dish during alignment are effortless. In addition the unique lollipop design of the dish/tripod stabilizes the whole system so you can be sure that even during high winds and bad weather you’re broadband is uninterrupted without the need for heavy tie-down straps and weights. EZ-NET uses a unique Diamond Dish design that when it is setup has the equivalent performance of a considerably larger dish, this is due to its design which has a much higher gain and efficiency than traditional round dishes. Sized at just L: 70cm W:70cm D:20cm the EZ-NET travel bag houses everything you need to Surf the net. See what you get with the EZ-NET Kit. Unlike systems from Oyster, Crystop, Teleco or Alden which cost well over £3000, need professional installation and require expensive lengthy subscriptions, EZ-Net is only £1500 with subscriptions starting at just £29.95 a month. EZ-Net gives you a broadband experience (up to 30 Mbps) from remote locations unlike offerings from Iridium GO with its 24kbps (0.024 Mbps) maximum or Inmarsat iSatHub at 384kbps (0.384 Mbps). With EZ-Net you can do all the things you would expect from a 21st century internet connection,. stream video and music and makes calls with Skype even with video. EZ-NET works area indicated on the map below. Packages start at £29.95 per month, Speeds up to 30Mbps available. Service contours are purely indicative and subject to change without notice.